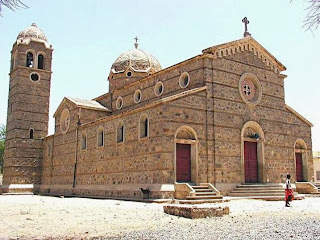 Nathan Barontini's Blog: Gloria tibi, Domine! Christ is really present in the Most Blessed Sacrament. At Mass we are transported away from our workaday world to the very foot of the Cross, to Calvary, to witness the offering of Christ of Himself to His Father in the Spirit. What was once mere bread and wine no longer exists. It is now The Lord - Body, Blood, Soul, and Divinity, despite the remaining presence of the accidents, the appearances, of bread and wine. We all know this from second grade CCD class, but do we live it? Here are some practical ways we live this great mysterion in our family. 2) Only receive the Eucharist when you are free from all mortal sin. 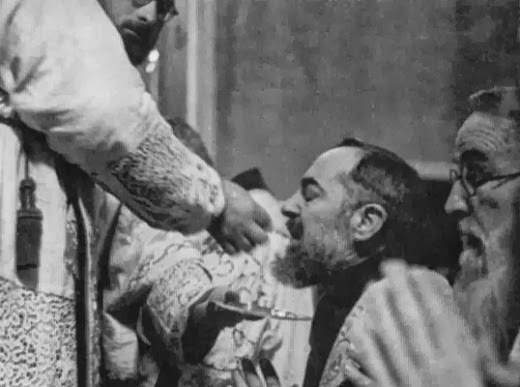 We know our venial sins are forgiven by receiving Christ at Mass in the Sacrament, but consuming His flesh and blood in a state of mortal sin increases our sin through an act of sacrilege. St. Paul tells us, "therefore whoever eats the bread and drinks the cup of the Lord unworthily will have to answer for the body and blood of the Lord. . . . For (he) eats and drinks judgment on himself" (1 Cor. 11:27, 29). If you commit a mortal sin, go to confession - meet Christ and receive His merciful love, then approach the altar. 3) Something I personally do, although this is not required of all Catholics (unlike numbers 1 and 2 above) is to receive Our Lord on the tongue, kneeling. I do this both at the forma extraordinaria (i.e. the so-called Traditional Latin Mass) and the forma ordinaria (i.e. the post Vatican II Mass), where I happen to be the only person to receive kneeling. This is a way to remind ourselves, and others at Mass, that this is truly the King of Kings and Lord of Lords we are receiving. It humbles us to kneel before him, to remind ourselves that we are nothing compared to Our God. Receiving on the tongue also forces us to recognize the uniqueness of receiving the Lord. This isn't regular food and the way we receive it should reflect, rather than obscure, that fact. What else do you eat by having someone place the food upon your tongue while on your knees? What else do you eat by putting it into your own mouth while standing? Again, this isn't required of Catholics, you're not a bad Catholic if you don't do it, but it helps me greatly to enter into the mystery of faith. 4) Silence. Be quiet and pray to the Lord before and after receiving Him. Forget about singing along to the communion hymn and just be still in God's presence. I usually recite the Anima Christi before heading up to the altar and the Sucipe by St. Ignatius Loyola afterwards. Then I sit in silence or unburden myself to the Lord. That is assuming my kids are cooperating! 5) Related to number 3 is genuflecting before the tabernacle before you enter the pew at church. This is a way of paying homage to Christ's presence among us. Note, we neither genuflect (i.e. briefly kneel on our right knees) to the front of the church, nor to the altar, but to the tabernacle - wherever it might be placed. 1) Adoration. I don't get away to adoration as much as I'd like to, but it is a great way to extend what we do at Mass and to remind ourselves of Christ's presence in the Eucharist. Kneeling before the Lord in the monstrance provides the silent contemplation of this holy mystery that allows us to be better disposed to receive the graces He wants to give us when we receive Him at Mass. Remember this is Jesus and He is sitting right there waiting for you to just be with Him. 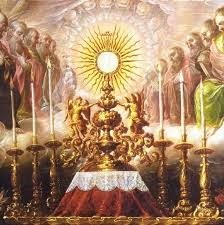 Adoration is preparation for Heaven, only then we will see fully what now we only see dimly (cf. 1 Cor 13:12). What do I do at adoration? Pray. Sit. Just be in His presence. Being there with Him is what counts. 2) Gloria tibi, Domine! This is an easy one, but it is very important. I teach my kids to pray a short prayer, typically gloria tibi, Domine whenever we pass a Catholic Church. Why? Because every Catholic Church reserves the Eucharist in the tabernacle every day (except Good Friday and Holy Saturday). When you pass a Catholic Church you are walking right past The Lord. Act like it! Doing something as small as saying a few words recognizing His presence weaves the reality of the Sacrament into the fabric of your life. Those are just a few ways to take the dogma of transubstantiation, something that seems so abstract and philosophical, and live it. Couldn't God have made Hell a nicer place?